For many individuals the Iran-Contra Affair was difficult to follow. It might be compared to a shell game, in which three inverted cups or nutshells are moved about, and contestants must spot which cup or shell has a pea or other object underneath. The simplest explanation of this political scandal is that it was an attempt to sell arms to Iran in order to secure the freedom of United States hostages, and to fund the Contras rebels in Nicaragua. Like many political scandals, the plan became complicated. Prior to January of 1979 the United States had been the largest supplier of weapons to Iran while that country was under the rule of the Shah of Iran. In November of 1979, Iranian students stormed the American embassy in Tehran and took 52 Americans as hostages. In retaliation, President Jimmy Carter imposed an arms embargo on that country. As the American weapons aged, there were no spare parts to repair them. In September of 1980, Iraq invaded Iran. This exacerbated the need for Iran to obtain new weapons and additional spare parts. On January 20, 1981, Ronald Reagan was sworn in as the new President of the United States. This was nineteen days after I married my bride. The new President pledged to continue the arms embargo of Iran. This was based on the conviction that Iran was a primary supporter of terrorism. 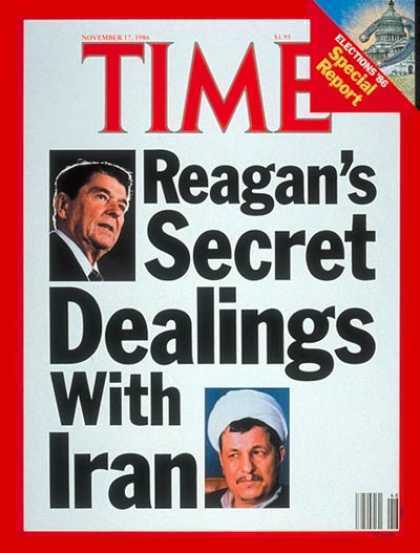 In July of 1981, a then secret study was given to President Reagan concerning arms sales to Iran. The study concluded that if the United States didn’t sell the arms to Iran, they could purchase the arms elsewhere on the world market. The study further concluded that if Iran purchased arms from the Soviets, there was a propensity for Iran to fall into the Soviet sphere of influence. The determination was made that the United States should resume selling arms to Iran as soon as it was politically feasible to do so. A broad diplomatic effort to persuade other nations all over the world not to sell arms or spare parts for weapons to Iran began in early 1983. This effort to apply diplomatic pressure to other nations occurred under the code name of Operation Struggle. It was ironic that the United States would be selling arms to Iran while attempting to convince other nations not to do so. The sales pitch was that the openly declared goal of Ayatollah Khomeini was to export his Islamic revolution all over the Middle East. He intended to overthrow the governments of Iraq, Kuwait, Saudi Arabia and the other Persian Gulf states. This should have, and did, lead the Americans to realize that Khomeini was a major threat to the United States. When Reagan took office in 1981, the Contras based in Honduras were waging a guerrilla war to topple the Sandinista revolutionary government of Nicaragua. A primary goal of the Reagan administration was to overthrow the left-wing Sandinista government in Nicaragua by backing the Contra rebels. Thirty-five years ago, on November 23, 1981, Ronald Reagan signed National Security Decision Directive 17 (NSDD-17), giving the CIA the authority to recruit and support the Contra rebels in Nicaragua. In December of 1982 Congress passed the Boland Amendment which outlawed U.S. assistance to the Contras for the purpose of overthrowing the Nicaraguan government. There were seven Americans being held hostage in Lebanon. The Americans were being held by Hezbollah, a militant group with ties to Iran. The original plan was to have Israel ship weapons to Iran and then the United States would send new weapons to Israel as replacements. For their part, the Iranians who received the weapons promised to do everything they could to obtain the release of the hostages with no guarantee. It was later amended to have the proceeds of the sales used to fund the Contras. The arms sales began in the summer of 1985. The scandal broke in late 1986. Reagan always insisted in public that the purpose behind the arms-for-hostages trade was to establish a working relationship with the “moderate” faction within Iran. This was done in order to facilitate the reestablishment of the U.S.-Iranian alliance after the death of Khomeini which was expected soon.